For Mother’s Day we took a bike ride to Antrum Park, and had a little picnic. It’s about three and a half miles from our house to the park, and I was a little worried that the kids would struggle, but they did fine. Carina noticed her bike tire was going flat as we pulled into our picnic area, so we agreed that I’d ride home later and come back with the van. At the park, Tyler and I took a walk around the lake, stopping to pet as many dogs as she could. While on our walk, I spied a turtle swimming not too far out, and we both watched it for several minutes. Tyler said “If I could come back as any animal, I’d come back as a turtle.” When I asked why, she said “Because they’re like peace. They’re so peaceful.” We walked on together, hand-in-hand, for about a quarter of a mile, just enjoying the sun, without saying much else. A little further along we spotted two more turtles, both sunning themselves atop a large log a short distance out from the water’s edge. 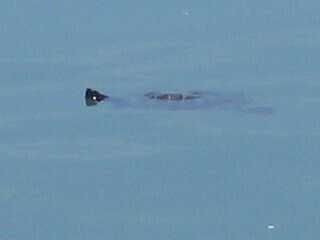 As we approached (I naively hoped to snap a photograph) the two turtles slipped into the water and swam off. We watched them wriggle for a bit, and then walked on. “Can I get a pet turtle?” Tyler asked, calmly. Carina and I have been staving off the “Can I have pet X?” questions for about a year now. With four cats, we feel our house is well stocked with pets; and neither of us are eager to inflict any more pets with the “loving attention” that our kids are so fond of giving. Usually we say “No” whenever the question of additional pets comes up, and patiently explain again why we’re saying no. But for some reason, Tyler’s question to me seemed surprisingly reasonable. Maybe it’s because in the past her desired pets were always dogs, or ferrets, or hamsters. 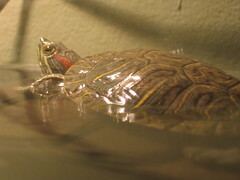 Further, I had pet turtles when I was a kid, and I enjoyed them immensely. Maybe it was time to give Tyler the chance to be responsible in a whole new way, I thought to myself. After all, she’ll never truly learn the importance of responsibility if she’s never given the chance. So rather than say “No” outright, I engaged Tyler in conversation about what would be involved, in a very general sense, with having a pet turtle. I asked her to consider how her sister would feel, that Tyler got a pet and Tayler did not. The conversation went on for about ten minutes, and as it did so I realized – with a sinking stomach – that she wasn’t really considering much at all, but instead fixating on how cool it would be to have a pet turtle. I wasn’t too alarmed yet, because Carina might have a very compelling reason against a turtle, and the issue would be finished. Since Tyler was calm, I felt complacent. We completed our walk around the lake, then Tyler accompanied me home to get the van, while Tayler stayed with Carina. We had a pleasant, quiet ride. Several times Tyler spoke about a pet turtle. Most of it was innocuous wishful thinking (what to name a turtle, what to nickname a turtle, etc). Several times, though, she tried to veer into decidedly specific issues, which I had to counter with “I still need to talk to mom about this.” For the duration of the ride home, and the return trip with the van, Tyler was okay with this. When we all got home, though, she had abandoned all attempts at patience. She wanted to talk about what she could do to get a pet turtle right now. In hindsight, Carina and I perhaps should not have been as direct in our reply as we were: we explained in gentle tones our concerns about the long-term health of any pet turtle, as well as our concern about fighting to get Tyler to maintain her responsibility to a living animal when we had to fight with her just to pick up her toys and brush her teeth and please stop taking the cat into the closet… Tyler began to sob, uncontrollably. She was devastated that she would not be getting a turtle right then and there, and she became increasingly distressed that she might never be able to earn one. Shower and brush teeth with out complaning. She cried and moped up to bed time. As a fresh outburst of screaming began, I was struggling for any way to fend off a definitive answer until such time as Tyler might be better able to deal with a “No.” And in truth, I just wanted it all to stop so she could go to sleep. I suggested that we could go to a pet store, to see how expensive turtles were. We’d also need to check the prices of aquariums, and food, and everything else necessary for a safe and happy turtle lifestyle. Finally, it was agreed that we would do some research first, and compare prices from several different pet stores. And compare we did. The next day I took the twins to three different pet stores. Tyler was well over her squall from the night before, so it was actually a very pleasant experience. We looked at aquariums, and filters, and food, and all the accoutraments; Tayler and Tyler diligently jotting down the prices of each component for later comparison. On our way out of the last store, a woman heading in overheard our conversation about aquariums and informed us that she had a twenty gallon tank she was trying to give away. I took down her number, thanked her, and headed home. Several days later I collected her aquarium. The week passed, and we all discussed The Turtle a little bit more each day. Carina took some convincing, but finally acquiesced. It was decided that the turtle would be a family pet, rather than just Tyler’s pet, in order to both alleviate any jealousy as well as to spread the responsibility around a little bit. Both girls were eager, and on their best behavior. So today, after some chores, we went to the store and picked out our turtle. The girls decided to name it “Minute”, which they thought was a cute name. As we checked out, Tyler asked it we could get a second turtle. Carina and I simultaneously said “No way!”.